Sushi, sashimi and robata in a stylish Philippe Starck space at the Andaz San Diego. 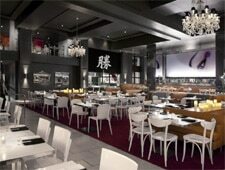 : Katsuya by Starck San Diego is set in a 6,000-square-foot indoor/outdoor space in the Andaz hotel. We had a disappointing meal composed of sushi, sashimi and traditional Japanese fare. There is also an expansive menu of robata selections prepared over an open flame.